Economic data, network readiness, boomers, and gosh-- an e-commerce use for print? Shocking! Disappointing revision to GDP for the 4Q-2005. Advance was +1.1%, preliminary +1.6%, and today's final was +1.7%. Other measures indicated it would have been a stronger revision. Corporate profits were very strong, +13%. Jobless claims down 10,000, and the 4-week average is down to 310,750. Countries com compared for their "network readiness" -- quite interesting. At the bottom of the press release you can link to and Excel sheet with the full rankings and a PDF of the executive summary. So, with that in mind, what makes anyone think they won't change media habits? They have, and they will. Here's a great example of how print and e-marketing work together. Printers can't do this? Some would think not. Sounds like a great application for digital printing, doesn't it. Doesn't it sound like something that could be totally automated? Sure does. Precision Dynamic Printing lets e-Dialog clients run personalized e-mail and direct mail campaigns from the same platform. For instance, e-Dialog clients that publish magazines have traditionally executed their renewals through e-mail. If a magazine subscriber changes his e-mail address, a renewal message will bounce and the customer may be lost. Using the new platform, an e-mail bounce would trigger a direct mail piece informing the subscriber that it is time for renewal. The British Printing Industries Federation and Pira have released a magazine and direct-mail report. Some who read this are going to deny it as too pessimistic or impossible. After all we've gone through, it's hard to imagine that people are denying that vast changes have occured to our industry. What's even funnier is when it's a supplier executive, whose on segment of the industry has consolidated so drastically. Prepress? Need I ask what happened to Scitex, Hell, Crosfield? These high flyers are now buried in organizations, barely the size that they were at their peak (even ignoring inflation!). Or presses... I have one word for you: Harris. But there's also Hantsco, Miller, Miehle, Multigraphics... others, too. Film? I remember when DuPont and 3M were part of the big three, and everyone else was almost meaningless and had to be in niches (Chemco, where I worked, was huge in the newspaper business, and miniscule everywhere else; Agfa's Copyproof was a great niche product). It's important to step back and see how much things have changed already before anyone poo-poos reports like this. (Note: BPIF has been having trouble with their website-- it's supposed to be up again on 3/27). Larry Elder has a good column about how good economic news is being reported negatively... and often inaccurately, I might add. When's the last time you heard about investment by non-US companies in the US? They can choose all kinds of places to invest in, yet they invest here. Or how about how often we set records for exports? Or that the number of employed persons is the highest in history? Nah! Popular entertainment is actually making us smart! This is an interesting perspective on the supposed decline in media. This is a countertrend to common wisdom, much like JK Rowling's Harry Potter series getting kids to read 700 page books in an era where reading is declining. We forget this important point. The US population is huge, diverse, and affluent compared to many regions of the world. You can have many countertrends existing at the same time and have both being very strong at the same time, and be of notable dollar volumes. EU vs USA: This is an interesting comparison made by a Swedish analyst. The recent riots in France over labor laws that would allow business to fire workers after a two-year trial period are just one sign of Europe's problems. In the US, it is becoming more common to try out the skills of workers as temporaries or as subcontractors. Being the latter actually creates a better understanding of employment as a marketplace phenomenon, and creates a resilience in the economy that over the long run raises wages. Eventually it comes down to the perception of risk. Elimination of all risk creates an economic stagnation that is hard to shake. The municipal wi-fi movement is gaining momentum. The expectation of constant connectability will probably take a great leap forward in as little as two more years (not counting cellular, which for all practical purposes offers that today). ExactTarget has released its e-mail response study. Print has better deliverability, of course. But that's not a good enough reason to use it. They also has an interesting case study. Ask yourself: can print do this? How could print have made it better? Ummmm.... gee what could the alternative contact strategy be? Personal visits? Expensive gifts delivered by personal couriers? Subpoenas? No; it's a printed message delivered by a uniformed government agent, often referred to as a postal delivery worker. This is the issue again: print makes e-commerce more effective. I'm not aware of any printer (I've given up on organizations) actively promoting this. I was speaking at an event recently and a CEO wanted a PDF of my slides so that someone else could print it out for him. The same person probably has others order things from amazon.com. In order to understand e-commerce, the Internet, and connectivity, and new media in general, you have to use it personally, and seek it out. Otherwise you can't see how print may relate to these other media. Roger MacNamee writes about this extensively in his book The New Normal. The original 2004 press release from his book is at http://www.goldbergmcduffie.com/projects/mcnamee/pr.html He's a gadget guru because he's looking for things to invest in. We're looking for things that clients will want to use to communicate with their customers. Advertising Age had a short article about teens and their use of cell phones. Remember, teenagers have this odd habit of getting older and ending up in the workplace. Their communications habits will become part of their worklife and shape their expectations for workplace technology and their media preferences. Speaking of using technology, the Adobe web site claims that there are 200 million PDFs accessible on the Internet. They're conservative. I constructed a Google search for PDF files and I came up with more than 315 million of them. Thanks to Richard Romano for this link to a tongue-in-cheek article about in The Economist comparing Moore's Law to the latest shaving technology. This article in Advertising Age reports the results of a study showing how MBAs are underperforming in consumer goods busibesses and may be a detriment to their companies. I wish I could say I was surprised. I was wondering about this for a long time. I've met many big-B-school MBA's and I can't say that they grasp the subtleties of situations well. Too often the most important decsion-tool they have is Excel and precede their pronouncements with "all that has to happen is..." I went to an unaccredited MBA program at the time, at Iona College in New Rochelle. We had many adjunct faculty who would teach courses after their long days at work at such insignificant companies like IBM, General Foods, Nestle, Pfizer, and others. I learned my MIS basics from the VP of MIS at the American Cancer Society who had just moved over from Sunshine Foods (he told us that there was nothing better than a Vienna Finger right out of the oven... he probably stayed at that job a year longer than he should have, just for that). I learned marketing models from the director of quantitative analysis for Pfizer. I did not have him, but finance majors and others were treated to investment class with the legendary Martin Zweig http://en.wikipedia.org/wiki/Martin_Zweig. (He was a regular on Louis Rukeyser's Wall Street Week and was famous for his "I'm worried, Lou..." when Lou would ask what he thought of the market). Many of the big-B-school MBA's only field experience is internships and special programs still tied to schools. In marketing, this is a problem. There's no better experience than field experience to give a foundation to MBA studies. I was never in sales, but I was on that path, and traveled fairly often with sales people, but fate took me in another direction. Having owned my own business in one form or another for 18 years, you quickly learn that you are always in sales, especially in small business. For those of you studying for MBAs, don't let anyone deter you if they wave this article in front of you. When I was at Agfa, I was told in these exact words "we don't need any MBAs around here" by the director of human resources. My studies changed my career, and I use something from my MBA studies every day. Just make them real, not esoteric. Models and formulas are great in the classroom, but not always in the real world. Use them to create an analytic discipline, know where they apply and where they don't. Even when they don't, the analysis of why they don't is revealing in and of itself. This economy values people with broad knowledge and exceptional implementation skills. It seems that the big-B-schools have trouble teaching the latter. E-mail more effective in Canada? Electronics for Imaging and Staples make a web-to-print deal. It's about time. You knew Staples wouldn't let this opportunity pass them by and let VistaPrint get everything. Think of Staples as Kinkos without the overhead of separate stores. I still think VistaPrint is in play for acquisition in the next two to three years, but don't be surprised if it's not sooner. Where are the franchises in all this? They couldn't have made a deal with someone? Are they the ones sleeping in the corner over there? The story of VistaPrint and the office superstores is that the franchises have done nothing to block them. The Internet now drives 25% of all retail sales. Even if they don't buy through an electronic source, more than two out of three shoppers research products online. Given the strategic importance of this channel, it is mind-boggling that leading retailers like Target, Toys 'R' Us and TJX outsource e-commerce or do not sell online. In contrast, one-time Internet sales specialists like eBay and Amazon now mail millions of catalogs and are rumored to be mulling building stores. The idea of an amazon.com store is probably dumb, but already stores supporting the eBay concept have been popping up nationwide without eBay's financial involvement. One of the concepts in retail management is the "wheel of retailing." It's good to keep that in mind, not just for the retail business, but also for communications media. The most important thing is that amazon.com and eBay are brands. Amazon is not a good executer of brand strategy: sure, everyone knows it as books, but the company has every intention of becoming the e-WalMart. Books still dominate its sales, yet it has many other categories that do not do as well, and won't in the long run. This kind of line extension has been historically quite deadly; amazon, for all of its sales volume, does not make much money (Trout & Ries write extensively about the "line extension trap" in their books Postioning and Marketing Warfare -- a summary is at http://marketing.mcdar.net/54412.php). eBay, on the other hand, is quite a strong, well-crafted brand. Its name has become the generic description of a marketplace of its own creation. Its profits show it much stronger branding strategy. It also tends to keep the brands it acquires as distinct businesses in the minds of its audiences (PayPal, Skype, etc.) rather than rename them "eBay Payments" or "eBay Phone." Bill Gates has trashed the $100 laptop idea as expounded by Nicholas Negroponte of MIT. Therefore, it must be a good idea. iPods in college as "study aids"
The "iPod generation" will be important to watch. They will be more open to the concept of "e-books" or whatever they end up being called at the time, and will expect all kinds of downloadable media over high speed networks wherever and whenever they want it. I would expect that some publishers are anxious to try "licensing" of textbooks for example, where you can download multimedia course materials and have them expire at the end of a semester or pay a fee for "lifetime access." Publishers have wanted to kill the used book market for some time, and time-limited electronic formats may be one way that they will try. Personal note: we've started making college visits with our son who is still ways from actually applying anywhere (though we know the old saw "the days are long and the years fly by" quite well). Every college we have visited "gives away" a "free" computer to all students, which they turn in at junior year for a new one. They can "keep" that second computer after they graduate. I'm amazed at how many people don't realize that's in the cost of tuition, but that's another matter. It's hard to believe that colleges won't be looking to leverage those IT assets more and more in the future. Whether or not the iPod thing catches on in other institutions may be determined how the iPod itself evolves into a powerful portable multimedia computer. If you don't think that's the path the iPod is on, then you're not paying attention. Waiting Around for Change? Sorry, It's Already Happened. The 2004 edition of the Annual Survey of Manufactures was recently released by the Commerce Department, and our analysis revealed some thought-provoking trends. The PrintForecast elves adjusted the data for inflation and calculated the annualized rate of change for the commercial printing business sectors. The way the Commerce Department classifies businesses is very important. More precisely, businesses are asked to choose the best description of their primary business, and the Commerce Department does little except to record the choice in their data base. The way to read the chart below is to say to yourself "businesses whose primary business is commercial screen printing reported that..."
The star of this data compilation is the “digital printing” category. Those businesses' volume increased in the 1997-2004 period by an average +28.3% per year. Commercial digital printing businesses went from a miniscule 0.6% share of the commercial printing shipments pie in 1997 and moved up to a 4.1% share by 2004, with more room to grow. The pace of growth has slowed, and was a robust +6.8% for 2004 compared to 2003. Remember, businesses may have reclassified themselves from offset to digital, so it's not likely that the increase is solely from digitally printed jobs. It must also be noted that “digital” can mean almost anything. Ultimately, these data should serve as a catalyst for change within individual companies and eventually ripple through the industry as more companies implement new strategies. It's time for printers to redefine their businesses, rationalize their equipment bases, clean up their balance sheets, invest in capacity that will be marketable three and five years from now, and finally come to grips with the industry's decades-old paradox of printing everyone's marketing materials but often averse to using marketing strategies itself. (How can we say printers should be in the "marketing services" or "communications" businesses when so few use those strategies in their own businesses?) Proactive organizations stay ahead of their clients and worry little about their competitors. The new media marketplace is real, with significant opportunities. There are many notable roles open for print and printing companies to successfully play in it. That is, if we really want to. These industry times certainly separate the elite companies from the average ones, the best managers from the mediocre ones. Everyone looks like a business genius in a growing market. But today, it helps to actually be one, and open to new ways of doing business, with strong skills of implementation. 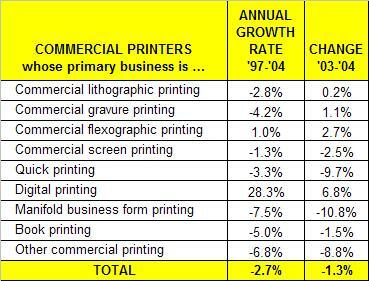 Interestingly, the relative share of other commercial print categories had only minor changes. Commercial offset businesses were 56.6% of the shipments in 2004; they were 56.8% in 1997. Gravure was 4.2% in 2004, and 4.7% in 1997. These don't seem like consequential changes, but the change in dollars is dramatic (or do I mean “traumatic”?). The report shows commercial offset as losing -$10.2 billion in annual shipments comparing the two years of 1997 and 2004. The size of that decline is more than 3.5x the total amount of shipments reported by commercial digital printers so it's not just a simple transfer of volume from offset to digital. Business went elsewhere, to non-print media. 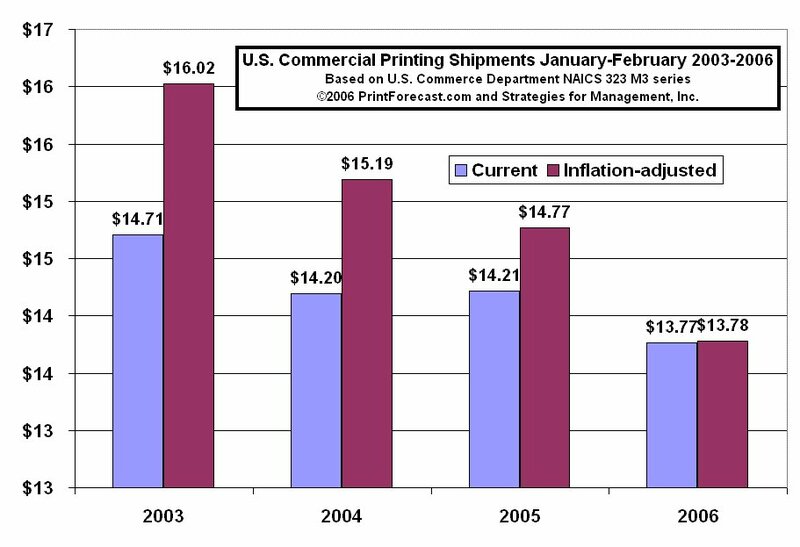 Comparing 1997 and 2004 book printing shipments, there has been a decrease of -$2.1 billion in annual volume. We know that some shifted over to digital printers, though the bulk of the “loss” has moved largely to non-U.S. print providers.Separately, and not in the chart above, trade binding and finishing is growing at the rate of about 1% per year. Prepress services, a victim of desktop publishing well before there was an Internet bubble, has lost $2.4 billion in annual shipments, a -6.8% per year decline. Many of those businesses redefined themselves as digital printers, or moved into services such as graphic design. What's all this mean? The industry continues to change. None of the segments noted are keeping up with GDP growth except for digital printing businesses. 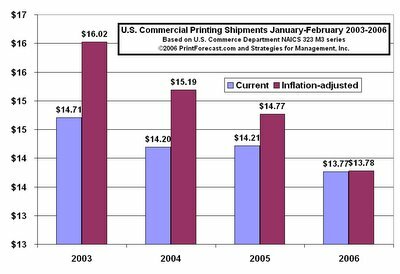 As the commercial printing industry headed into 2005, there was some reason for optimism, as the intensity of the downturn seemed to subside and looked to be bottoming. As we know, the downturn restarted in late Spring 2005 and culminated in a December that was down -9% to 2004. None of this matters to growing companies who anticipated these changes and moved accordingly. I worry that there are still executives who look at data such as these and deny that they exist or claim that they must be wrong and otherwise dismiss them. (Data are always more “acceptable” and unquestioned when they show positive growth; cognitive dissonance has no place in the board room, but we know it's there). Anecdotal support for the trends above are all around us, and need not be documented now. In the end, data are just data, the residue of past business decisions, often by long- departed managers. Those past actions have played out in a marketplace in unanticipated ways. It's essential to look ahead with an understanding of how one's company can thrive in a variety of future scenarios, not just minor yearly incremental changes. The question is not how to survive, but truly thrive. Managers need solid market information that reflects the marketplace as it is. It's their job to change the marketplace. Without good data, how can one know what needs to be changed and whether or not their attempts to create change have been successful? Article about launching the "magazine" online first, building up some buzz, and then introducing the print version. Confusing article about direct mail: do postal rates matter or not? The article quotes some mailers as saying no, that their business is great. I don't think they do matter except at the margins. Postage is one of many costs, and the others, while not always as large, have to be viewed in the larger context of cost of acquiring a sale. Now that there are so many alternatives to reaching audiences, the former costs of postage can be avoided by doing something else. Spending on paid web content at new high; yet only 12% of web users buy content, which is perceived as a great opportunity. Two-thirds of active U.S. Internet users use broadband, which is an increase of 20 million more broadband users than last year. Broadband changes everything! Of course, the government is stepping in with some money to set up a "printing city" in Dubai. Gosh, the equivalent of Varick Street (NYC) or Printers' Row (Chicago) in Iran? Haven't they heard about the Internet? Al Ries nails GM's biggest problem: its branding. The cars stink, but if the branding was right, that would at least give a sense of what they should be building. There are marketing lessons in this article for everyone. Journalism.org has published their State of the News Media 2006 report. It's really only available online. Last year's was an excellent example of what can be done on the Internet when presenting a large amount of information. I highly recommend the site. Lots of data, and not just about newspapers. Knight Ridder had an interesting history in new media, bungling its Internet opportunities. It was a pioneer in delivering text over cable TV systems, and its ownership of information services company, Dialog. I've always felt that the reason big companies mangle new paradigms is that they have too much money and too much to protect (the Internet bubble was just too much money). Startups do best when they are forced to make hard decisions about scarce resources, and therefore take more well-considered risks. This article discusses one of the early attempts to get news and information online. I remember it well. And speaking about newspapers some more, the Newspaper Association of America is stepping up to the plate with a better promotional campaign than its brethren at the magazine association. The Postal Service is going to allow advertising on stamps. I always liked this "allow" thing. It's in the vocabulary and culture of the institution that is this strange combination of bureaucracy and business. One expression I have always liked was JFK's description of Washington, DC as being a combination of his native New England and the South: "Northern hospitality and Southern efficiency," he used to call it. The metaphor describes so many things so well. I'm so happy the USPS "allows" us to use their service. Nice little story about PC maker Alienware. See? You can find niches in commoditized markets! I never knew that forcing people to be their own order-entry clerks was called "customer experience." In that sense, it means that customers are cheaper to hire than cashiers. Forrester says that "A majority of decision-makers said they would increase budgets on analytics and customer behavioral research" The report claims that 65 percent of their interviewees said that "shifting customer interactions to the Web was a top priority." It also said that kiosks, speech recognition applications, and automated phone centers. Automated phone centers? Less money for voice mail hell? People stop me at trade shows and thank me for recommending PowerDesk, the replacement for Windows Explorer. It's jam-packed with features that help you manage your files. If you're a PC old-timer and remember X-Tree, Lotus Magellan, and the short-lived Norton Navigator, you'll be pleased to know that PowerDesk is all of these things and more. I just noticed that they now have version 6 up as a free download. It doesn't have all of the features of the paid version, but it is still incredibly useful. We have posted a sample of this weekly report. It's issue #7 from February 23, 2006. It is a 5,7mb zipped file with a PDF and MP3 file. That week's topics were the release of leading indicators, the Federal Reserve's capacity and capacity utilization data for printing, the employment trends for printing and creative businesses, and the Outsell, Inc. advertising effectiveness study which showed print as being in the top three for brand building and lead generation. We are offering a 5-week trial for $49. A 44-issue, one-year subscription is $475; we are discounting it by $50 when we process the order. I was pleased to be a part of making the case for Harrie Lewis, a mentor for 15+ years, to receive the NAPL Lifetime Achievement Award in Orlando on March2. I could not be there to see him receive the award, but Harrie mailed me the text of his remarks. In all the years I worked with him, Harrie's off the cuff remarks would always put the industry and research in perspective for me. I was truly blessed to have worked with him as a client and eventually as his lead consultant. Below are his comments. The printing industry was always colorful, and Harrie was part of a family that made it yet more so. The line in here about "wood engraving" is just priceless. Tonight. I am astonished to be here! Grateful, too, for the long institutional memories of Joe Truncale and NAPL, of Bill Lamparter, Neil Richards, Dr. Joe Webb, Gregg Van Wert, Marguerite Van Stolk and others who played a role in designating this award for me. I have been away from our industry since 1998 when the Blue Books and Harrie F. Lewis & Associates were sold to Cahners, now Reed, where they rejoined their long ago partner, Graphic Arts Monthly, and that is a long time. My lifetime achievement is bound up with the Graphic Arts Blue Book and its marketing information services. Here is the story of how it was founded and grew. Abraham Franklin Lewis, my oldest uncle, was born in a ghetto village in Poland in 1873. The Lewis family emigrated to London and, from there in 1888, to America. They settled in Chicago where my grandfather was a fine gentlemen's tailor. Nevertheless, they were poor. My father, Meyer, ran away from home at 13, to get more to eat. He grew up as an itinerant farm worker, following the harvest from Louisiana to Canada, sometimes sleeping in hobo camps and riding the rails under freight cars for transportation. Uncle Abe became a printer. Shortly after 1900 he had established his shop on South Dearborn Street, where he did letterpress job work, setting hand type, and enhancing his gregarious instincts to become everybody's friend. Work was a 12 hour day and, in time, the venue for the subsequent evening's crap game settled at Abe's print shop. Players would send one messenger to the corner saloon with the growler, for beer, and the other messenger home to tell their wives they had to work late. The composing stone would be pushed up against the well to provide a rebound, and everybody...printer, typesetter, bookbinder, paper salesman, ink salesman, engraver...knew that Abe's was where the action was. Telephones were just coming into use among small businessmen. Abe, who was always an experimenter, got one. Soon, other crapshooters also got telephones in their shops. There was no telephone directory so, as Abe walked around his shop, composing stick in hand, he would set type for the names and phone numbers of others in the game. After pulling a proof on his Vandercook proof press, he nailed a printed card on the wall. As more printers got phones, he would revise and reprint and nail up an enlarged card. Soon, a printer said, “Abe, that's a handy card you have there. The next time you reprint it, pull an extra copy for me. Those are all my friends, too, and I often need to call them. Soon the card became ubiquitous in South Side print shops and one day a crap an ink salesman, came to Abe and said, "Everywhere I go I see your card on my name on it and my competitors names, too. The next time you reprint it, print my name in bold face type and I'll contribute a case of whisky to the crap table." Abe got it. The industry needed a directory and the supply salesmen would pay for it with advertising. In 1909, as a subsidiary to his print shop, Abe established A. F. Lewis & Company and in January 1910, he published the first edition of the Printing Trades Blue Book, covering printers and suppliers in Illinois. It had about 150 advertisers, including Vandercook and Rouse, and, I think, Miehle, Chandler & Price, and most of the other eminent old time names. Abe also depended on advertising income from small trade shops such as typesetters and bookbinders of whom there were many in Chicago. A few blocks south of his shop was skid row for the drunks of that day. Each morning they would pull themselves together and amble up Dearborn Street towards Marshall Fields and Carson Pirie Scott where they would panhandle. Abe would intercept one or two of the more presentable, outfit them with Blue contract forms and a list of prospects and send them off to solicit contracts for space and bold face listings. A page was $40. A quarter-page was $15 for a year. When they came back in the afternoon with contracts and deposits, Abe paid them half in cash and half in whisky. After a couple of years of moderate success, Abe realized he needed a more professional approach and so he summoned Meyer, my father, who was working in California running newspaper circulation contests. Meyer took over sales and did well. He realized, however, that success lay in making the Blue Books national and so, in 1915, he came to New York to open an Eastern Office. Soon, there were five editions covering 48 states. Blue Book information was collected through annual questionnaires, using an Addressograph system for mailing and record keeping. By the late 20s, direct mail advertising was evolving and Abe's advertisers began asking him to address their mail to his list of printers. Soon, some said they didn’t want all the printers, only those with certain types of equipment or product specialties. Abe realized that, if you asked a printer what kind of work he did, you would get a different answer from one month to the next. But the printer could answer questions accurately about what equipment he operated, and, so, on promise that this detailed information would not be revealed in the Blue Book, it began to be collected, which allowed Abe and Meyer to provide specialized lists to sell specialized products or services by direct mail. Publishing proceeded through the Depression and after the war, hampered by ill health for both men. In 1957, when my father lost his two partners to accident and stroke, I moved back to New York from my job in Pittsburgh and began the arduous task of reviving and expanding Blue Book services. I had been in the midst of a successful academic and consulting career in market research, and could see that Abe’s relatively primitive but prescient idea of collecting equipment information offered a way to quantify marketing information, not only for direct mail fulfillment but to validate investment decisions in new products by identifying and quantifying market share and potential. This soon became an important part of our business and it remains so today, utilizing the Blue Book's unique data bank. The Printing Trades Blue Books became the Graphic Arts Blue Books. More editions were published with enhanced marketing information. Harrie F. Lewis & Associates developed Blue Book Marketing Information Reports and engaged in marketing studies for GAMIS and on a proprietary basis for Eastman [Kodak], DuPont, 3M and many others. Son Tim ran the business when I retired to part time activity, with Dr. Joe Webb carrying most of the professional workload. Facing the diminution of trade shops and the blurring of the definition of commercial and other types of printing that has been driven largely by computers and digitization, Tim sold the company in 1998 to the publishers of Graphic Arts Monthly, which also had been founded by the vision of Uncle Abe. All of our 23 employees shared in substantial bonuses from the proceeds of the sale, and all became fully vested in their accounts in our defined contribution profit sharing trust for which our company had paid all the contributions and invested them successfully in equities since 1967. Thank you for adding to it by inviting me here tonight, and for this splendid award which I shall treasure. The unemployment rate went up to 4.8% despite the addition of 243,000 payroll jobs. Net revisions to December and January were -18,000 from previous estimates, which are minor in the grand scheme of things. More people working than ever in the history of the United States? Nah, that'll never be in the headlines. How can the unemployment rate go up with so many new jobs added? Because people who are encourged by the prospect of finding work (let's call them "encouraged workers") jump into the workforce and increase the denominator of the calculation (1 - (employed/(employed+seeking employment))) . Interesting story on Proactive Packaging of California. I always thought it was funny that the jargon of sales management is "we need to move some boxes" referred to the urgent need to sell something, and had nothing to do with boxes (other than the fact that what was sold was in one, probably). What do they say in the box industry? This article sheds no light on that mystery, but explains how this sector of the packaging industry is changing and one of the companies that's doing it. Yet again, I got a Print Council press release... as a MSWord file attached to an e-mail. I immediately went to their site. Yet again, the release is not on their site. Need I say more? Compunding matters is their URL. Any skeptics about the importance of and media-consumption changes that broadband will yield in coming years must read this. Skype is aiming at small business. That's not to say that small businesses don't already use it. All of us in the PrintForecast business, from the partners to the subcontractor suppliers of support services already use it. Yet another example of how small business can be way ahead of larger companies when it comes to implementing the latest technologies. It's yet another broadband story. Extended battery life coming for portable computing. Hooray! The companies that will drive the next phase of the Internet revolution is the theme of a Business 2.0 story about what startups and incumbents to watch for the next Internet wave. I already use some of the software and sites they mention. By now, executives in the printing should know that the Internet is worth watching, right? The underlying technology that will make e-paper (and e-fabric) possible... creepy stuff! Interviews of media-mucky-mucks from the big 4A conference held in Florida last week. They're referring to the media markets where consumers are in charge as "non-linear markets." Next, we'll be seeing the acronym NLM for that. Just what we need: another TLA (three-letter acronym). This has been rumored for quite some time: Heidelberg dropping the -DI press. This appeared in the UK's PrintWeek. Heidelberg has a long history of not saying that products are gone, they just fade away. I wonder if the executive quoted got any "correction" from the home office about this. Whatever the case, Presstek is making money, and I've always suspected that relations were not always the best. Both companies will have this behind them and can move on. Presstek is already marketing a press under its own name. I don't know who makes it, but I suspect Ryobi does. RSS is a critical new technology in publishing but its marketing and ease of use seem to be developed by primitive zombies from some forgotten corner of the earth. Some catalogers are starting to use the technology, according to the International Herald Tribune. This article gives a good summary of the current state of the process and its acceptance. HIGHLY RECOMMENDED software at a great price: Norton Ghost 10.0 for only $8 after rebates, with free shipping. January typically represents 8% of U.S. printing industry shipments for the year. In current dollars, January's shipments were $6.878 billion, down -$279 million in current terms, -$564 million in real terms. December shipments were revised by +$7 million, which made the revised total for 2005 $88.36 billion, or $89.715 billion in inflation-adjusted terms (we adjust data monthly based on the latest CPI). Assuming that January is typical of the year, in current terms, 2006 will be $87B, or down -$1.3B from last year. Because of the change in the industry's seasonality, March is likely to be printing's biggest month. It is probably going to be the bellwether month that will give a better indication of the rest of the year. We won't have March shipments data until early May. February data will be released on March 31. "Data-to-Go" has a short Powerpoint presentation for easy cut and paste into reports and elsewhere, a PDF, Excel file of the raw data, and a MP3 file of my commentary. My post of Friday 2/24 explained how the statement “every one percentage-point reduction in GDP growth cuts printing industry revenues by more than $1 billion.” It just doesn't work out. But since they revised GDP for the fourth quarter to +1.6%, the actual number in decline of GDP from average to the decline in print for that time period is $3.9 billion per point or 4x as bad as the rule of thumb would indicate. But that's not statistically valid anyway. What is valid, with an r-squared of 90% (which is stunning from a statistical forecasting perspective), is the relationship of the percentage of retail sales that are conducted by e-commerce and inflation adjusted printing shipments. That is now a mere 2.2% ($20.8B for Q3-05) of retail sales, but the equation generated by using that in a linear regression model is rather incredible, showing a -$1.84 billion drop in commercial printing shipments for every 0.1% change in the share of e-commerce as a part of total retail. The absolute value of the errors using it as a forecast model is only 2%. PrintForecast Contrarian View subscribers will get the details and what it means in this Friday's podcast.